Different worlds have different laws. But everywhere you go, you're going to find people who bend and break those laws and turn a healthy profit doing it. Whether sailing the high seas or the Flow, they are called pirates. It's these pirates that you've been hired to hunt. With letters of marque in your mapcase, your job is to track down and capture, alive or dead, some of the most dangerous characters in the known( and unknown) spheres. Of course, not everyone in space is a pirate. You'll also meet Torgan Betz (a man famous for bending the laws, rarely breaking them), Tiktitik, the Thri-kreen crusader, " Thought Taker," the illithid, and the feared Drow commander Teela Darkcloud. Even so they all have their personal agendas, and it's often hard to tell enemies from friends. Skull & Crossbows is an anthology of adventures for the Spelljammers campaign setting. This 64-page anthology easily follows Wildspace, but can be used in any existing AD&D Spelljammer campaign. 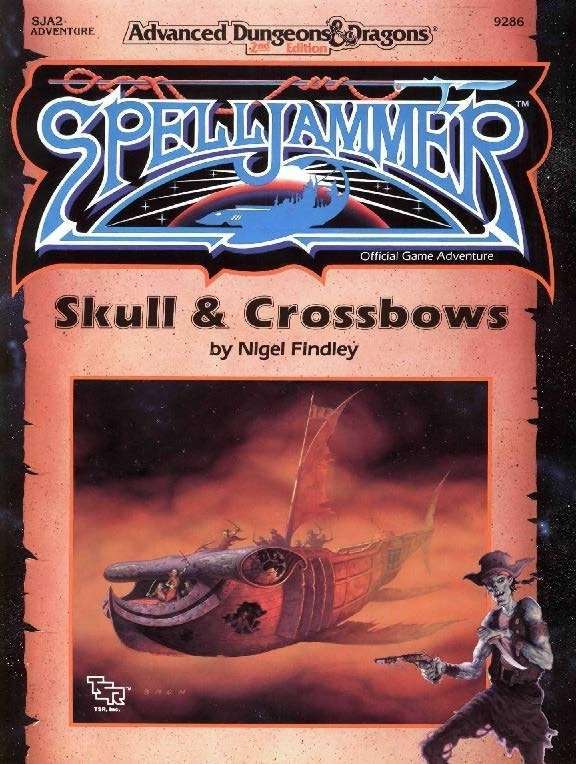 SJA2: "Skulls & Crossbows" (1990), by Nigel Findley, is the second Spelljammer adventure. It was released in June 1990. Continuing the "SJA" Series. The Spelljammer adventures began a few months previous with SJA1: "Wildspace" (1990). "Skull & Crossbows" continued in the same mold, as a standalone adventure — something that would remain true until the "SJA" series morphed into the "SJS" and "SJQ" module codes. Adventuring Tropes. Though "Skulls & Crossbows" is theoretically a campaign about hunting down pirates in Wildspace, it's actually an anthology of 19 different short adventures, with considerable variety among the adventures. Some focus on piracy, some are about "relics and hulks", and some highlight the various races of Wildspace. The result is a really open-ended series of scenarios that could easily be used in any Spelljammer campaign. The anthology format, with its very short adventures, is similar to REF3: "The Book of Lairs" (1986) — though it's less constrained than the Book of Lairs, offering up larger adventures that aren't just monster dens. Ironically, Spelljammer would eventually publish its own Book of Lairs too: SJR8: "Space Lairs" (1993). About Piracy. Earlier the same year, TSR published its first major sourcebook on pirates for AD&D: FOR3: Pirates of the Fallen Stars (1992). Expanding Wildspace. "Skull & Crossbows" is nicely integrated into the Spelljammer setting, thanks in part to its occasional returns to the Rock of Bral. It also features various Spelljammer races, such as the neogi and thri-kreen. Its biggest expansion of the setting is its introduction of space drow, who appear in two different adventures, "Void Elves" and "Monarch Armada". About the Creators. "Skulls & Crossbows" was one of five different TSR books that Findel wrote in 1990 (while simultaneously working for FASA and Mayfair). He'd return to the Spelljammer line with SJR4: "Practical Planetology" (1991).